Besides getting rave reviews from my husband, this Butternut Squash Quinoa Salad has a bright, fresh, clean flavor that just makes me feel good when I’m eating it. 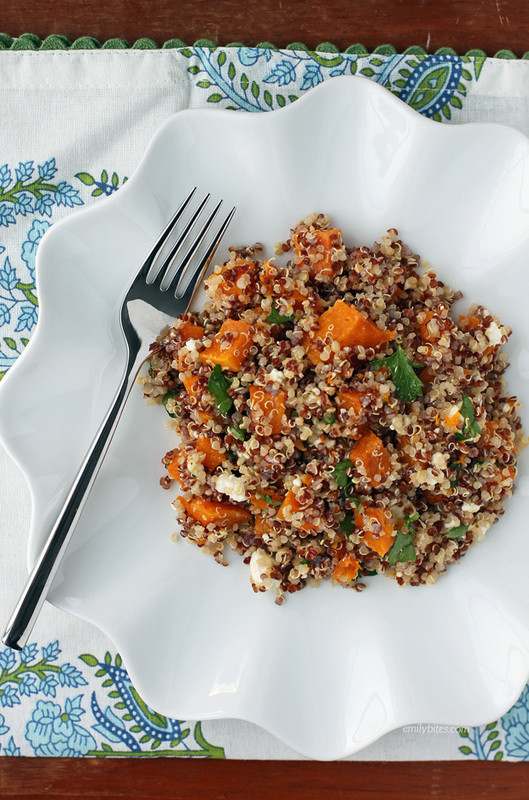 The citrus flavors from the dressing, the rich creaminess from the goat cheese, the sweet roasted butternut squash and the freshness of the parsley just combine really beautifully with the earthy quinoa. This dish makes a great side dish, but it’s also really nice in a larger serving for lunch. I listed two serving sizes below, so you decide how you’ll serve it! 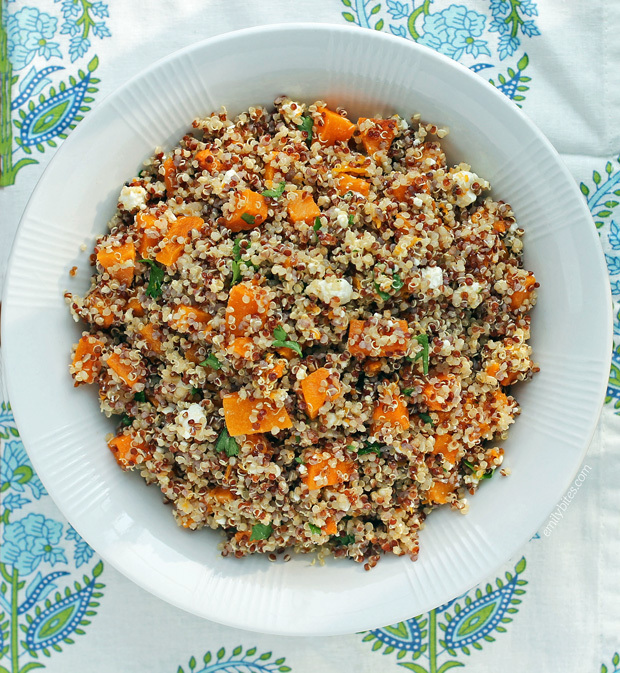 I was inspired to make this Butternut Squash Quinoa Salad after visiting the Sabra headquarters last week where their chef made us a quinoa salad with butternut squash. It was incredible, so I couldn’t wait to get home and make my own. I used some different flavors, so it doesn’t taste the same, but I love this one as well! I totally recommend cooking the quinoa ahead of time. I tossed mine into our rice cooker on the white rice setting and it turned out perfect, so if you have a rice cooker that’s recommended! Looking for more tasty lightened up salads? Check out my Greek Orzo Pasta Salad, Harvest Apple Salad, Hummus Chicken Salad, Doritos Taco Salad, Buffalo Chicken Pasta Salad, Cheeseburger Salad, Avocado Chicken Salad, Chicken Souvlaki Salad and more in the Salad section of my recipe index! Preheat the oven to 400 degrees. Toss the cubed butternut squash in 2 teaspoons of the olive oil and sprinkle with cracked sea salt. Spread the squash onto a baking sheet in a single layer. Pace into the preheated oven and bake for 25 minutes. Remove from oven and allow to cool for 5-10 minutes. 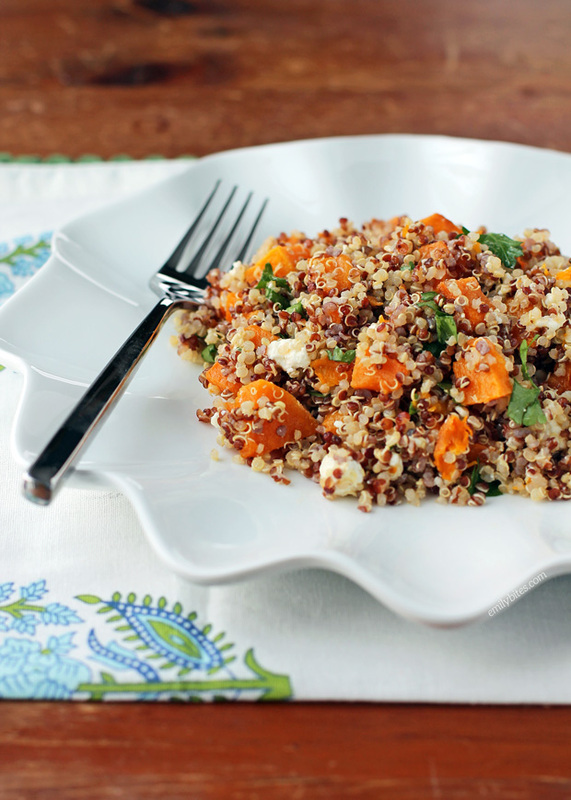 When the squash has cooled, combine it in a mixing bowl with the quinoa and stir in the goat cheese and parsley. In a small bowl, combine the remaining tablespoon of oil, the orange juice, lemon juice, cider vinegar and honey and stir together until combined. Pour over the quinoa mixture and stir until the salad is evenly coated with the dressing. Serve at room temperature or chilled. This is not something I’d have ever thought to make, but it looks fantastic! I think I’ll give it a try. This looks delicious. I have never ate goat cheese. I am a cheese person except for regular cheese. Ha! It has to be melted too or I can’t handle it. This sounds amazing! And I have a pound of pumpkin in the fridge. It’s fate. This will be my lunch for the week. Made this today, it is fantastic! Can’t wait to have leftovers for lunch again tomorrow. Could not find goat cheese, so I substituted feta and it worked well. Thanks for all of you wonderful recipes! I made this last week and substituted roasted sweet potato for the squash – what I had on hand. Loved it! It made a great, easy to grab, lunch. Thanks so much for the recipe! We really enjoyed this recipe…I didn’t have any goat cheese but used parmesan instead and thought it was great. Even the leftovers are delicious! Thanks for sharing this recipe. I just made this for my lunch at work this upcoming week. It’s delicious! I used a goat cheese with herbs in it. So yummy! Thank you! Do you have any ideas for fun add-ins or substitutions? Thanks Emily. I’ve actually made this before and loved it. I just forgot how much quinoa I used last time. Thanks for the reply and for the lovely recipe. Will this taste good without the goat cheese? If so, can I just leave it out, or do I need to substitute with something. Trying to make it dairy free. This looks so yummy! Do you know if this would this keep well for a week’s worth of lunches if I made it on a Sunday? Thanks for the fab meal idea. I love anything with goat cheese! This looks amazing! If I don’t have any apple cider vinegar, should I replace it with something else? or can I just leave it?